Subscribe to the newsletter and you will know about our latest posts and plans. A vision of a pair of corkscrew horns with a dash of black in the milieu of the rising sun amidst the golden grass. 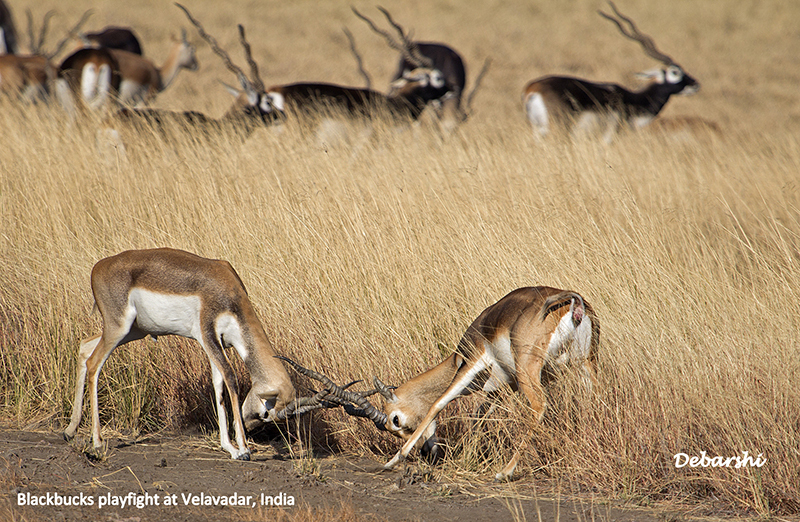 Well that’s the famed Blackbuck in Velavadar. The Blackbuck (Antilope cervicapra) is an Indian diurnal antelope found in the subcontinent, extinct in Bangladesh. 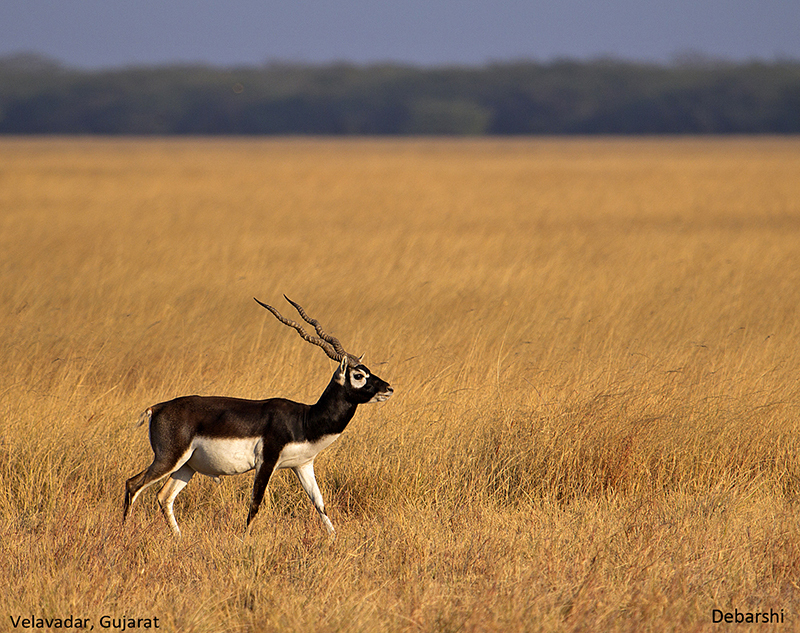 They inhabit grasslands and scrubs and can be observed in large herds in the Blackbuck National Park in Velavadar in the Bhavnagar district in Western Indian State of Gujarat. 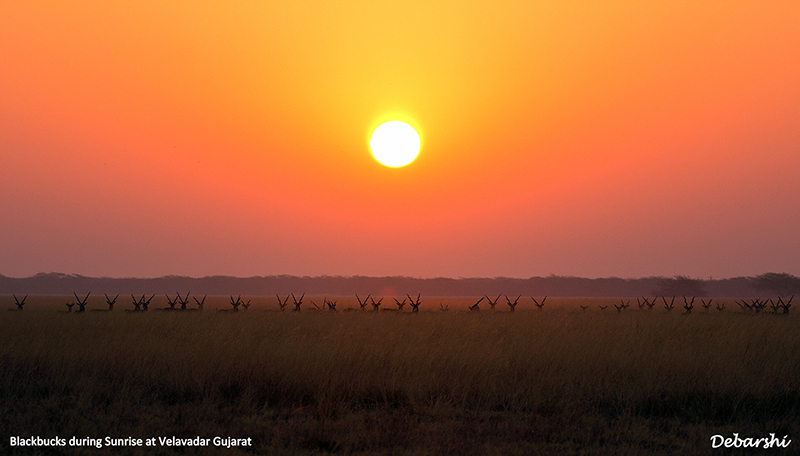 Once upon a time, this was the private grassland of the Maharaja of Bhavnagar for hunting blackbucks with his famous hunting cheetahs. In post-Independence India, this park was established in 1976 and doubled in size in 1980 covering an area of 34 square kms with Gulf of Khambhat on the south and wastelands and agriculture fields in the north. The park is divided into the Grassland Area (17.5 square km) and the Wetland Area (over 10 square km) separated by a road. 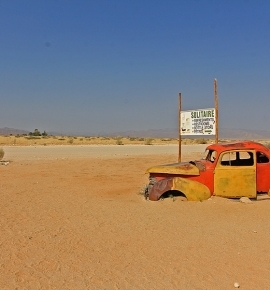 Both of these areas are often perceived as wasteland and are threatened. 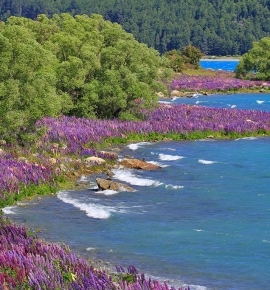 With growing awareness of the fragile ecosystem among locals, these areas are now beginning to be protected. 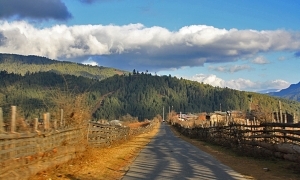 Recently Velavadar has been classified as an Important Bird Area by Birdlife International. 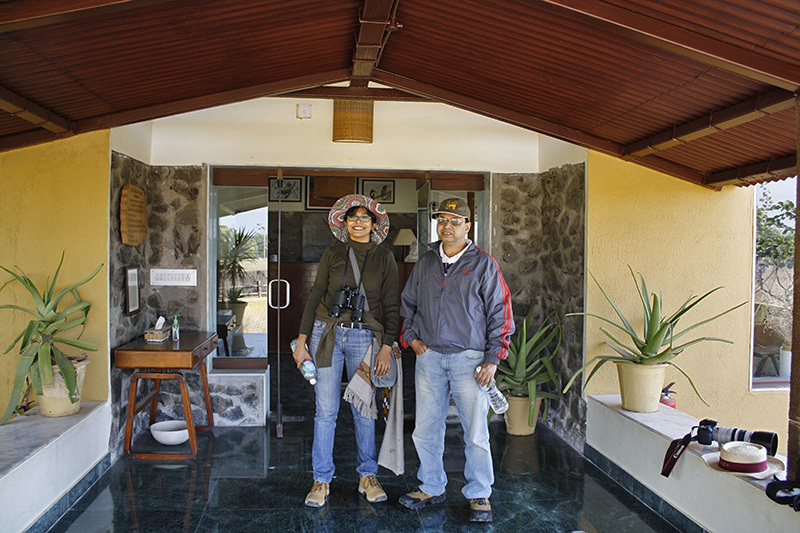 Debarshi & I with our travel buddies – Dr. Asok Majumder and Wildlife Photographer – Siddhartha Goswami had traveled to Gujarat in January 2013 on a tour of migrant birds. Our journey covered Velavadar, Rann of Kutch and Marine National Park; I will cover them in later posts. 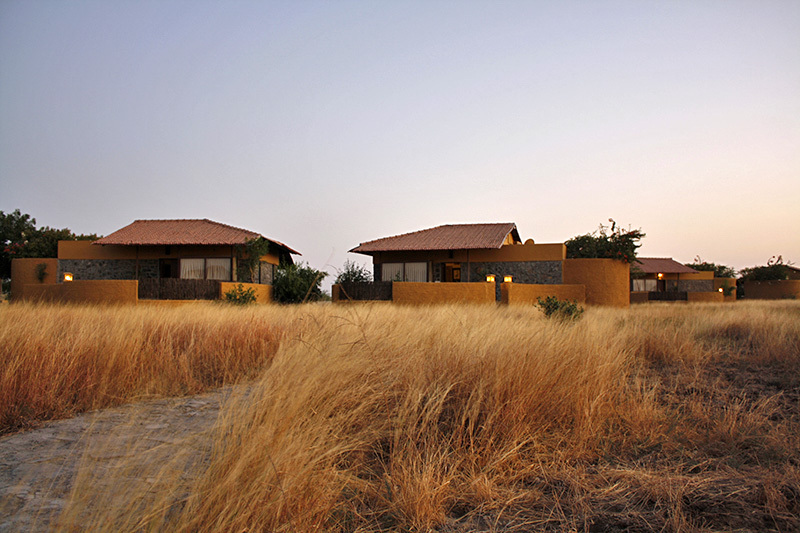 We had flown in from Kolkata very early and then drove down from Ahmedabad and reached by late afternoon just in time for the afternoon safari. We also went on the next early morning safari. Both the days were quite worthwhile. 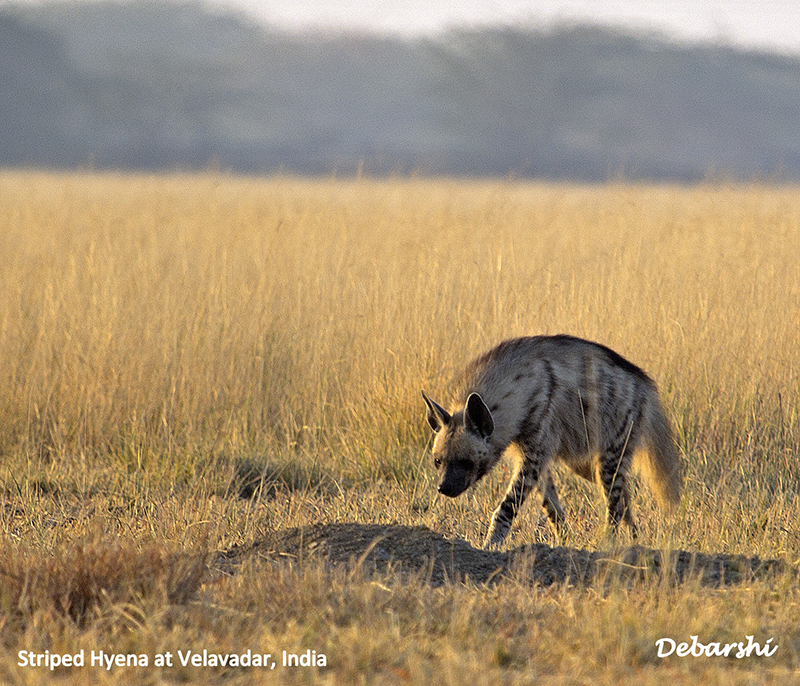 We got very good sightings of Striped Hyena and Golden Jackal. Of course, the signature species was pronking all through and gave us great photographic moments. For the uninitiated, pronking is a special behavior exhibited by black bucks to escape from the clutches of predators, although I felt that they were showing off their agility as well. 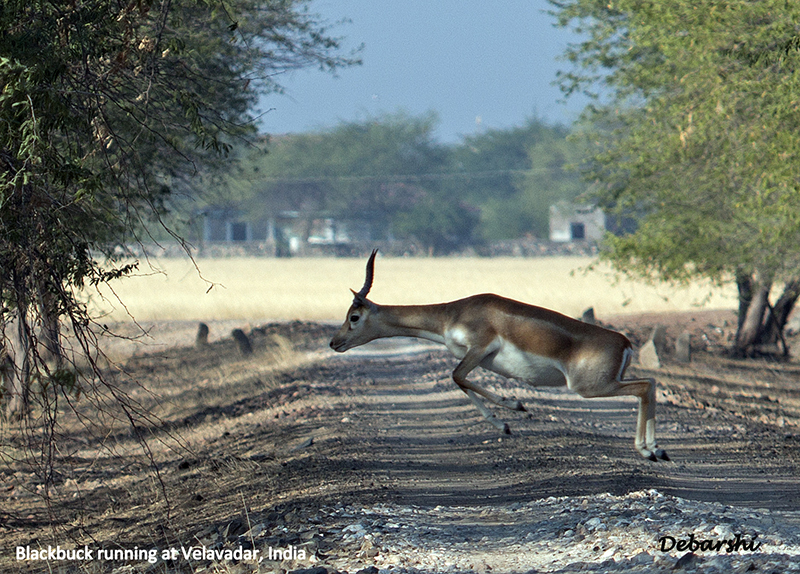 The blackbucks just dashes off and suddenly leaps midair with all its fours in the air. The male black bucks are distinguished from the females or calves by their moniker horns and black upper bodies compared to a fawn coloured bodies of the females. We also spotted more of the Nilgais or the blue bull in the park. They are much much larger in size and are so named because of the bluish grey coat in adult males. This park is truly a haven for bird watchers and more often for birds of prey. 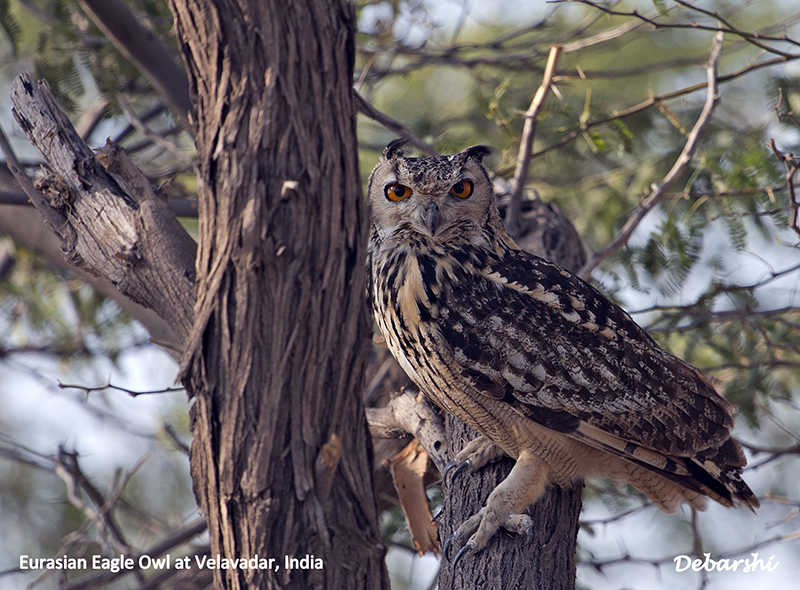 We spotted and clicked Steppe Eagle, Tawny Eagle and Imperial Eagle. 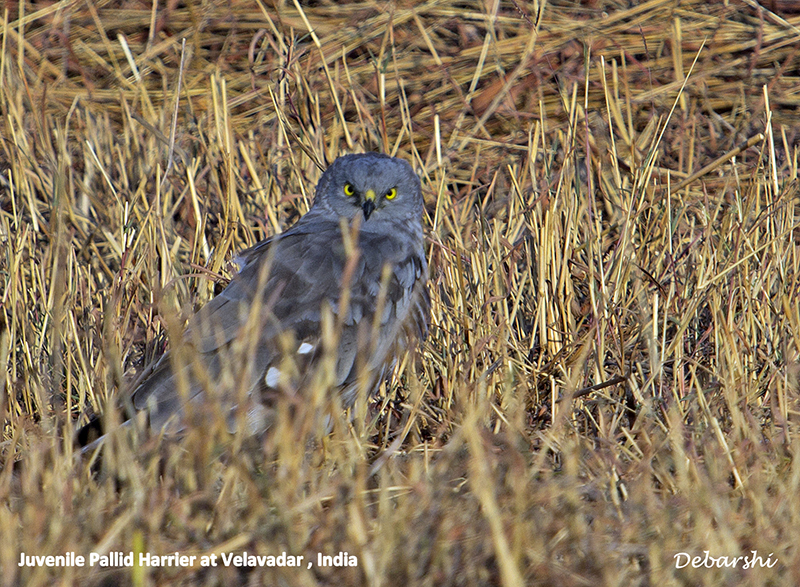 Also touted to be one of the major harrier roosting sites globally, we spotted the Pallid Harrier, Montagu’s Harrier, Western Marsh Harrier and Short-eared Eagle Owl. In addition, we sighted other species like Lark, Pipit, Grey Sandgrouse, Grey Francolin, and Stonechat. We were not fortunate enough to spot the Lesser Florican, a critically endangered species locally known as the kharmor. It is an endemic Indian species of the Bustard Family and today the principal population is in this park. 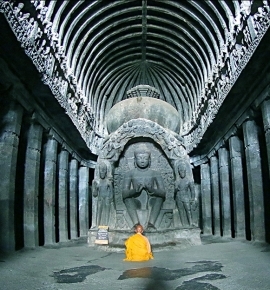 The best time to visit Velavadar is the Indian winter; i.e. ; from December to March .The Park is closed for the monsoon from Mid-June to Mid-October to support the breeding season of mammals and especially endangered species like Lesser Florican (Sypheotides indicus). 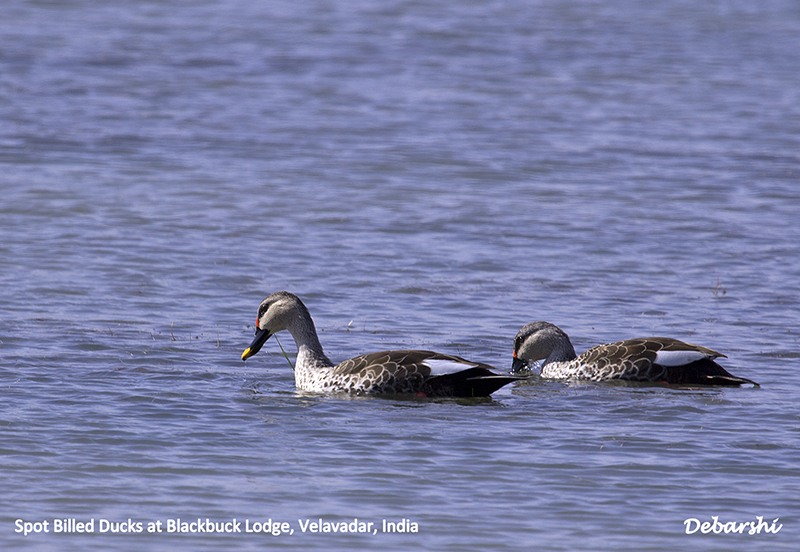 Winters are really the right time for bird watchers in Velavadar. 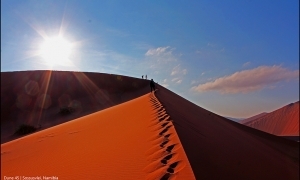 The weather is comfortable and temperatures often drop to less than 5 degrees late nights and early mornings. There are over 200 avian species and winter brings a considerable number of avian migrants from Central Europe. 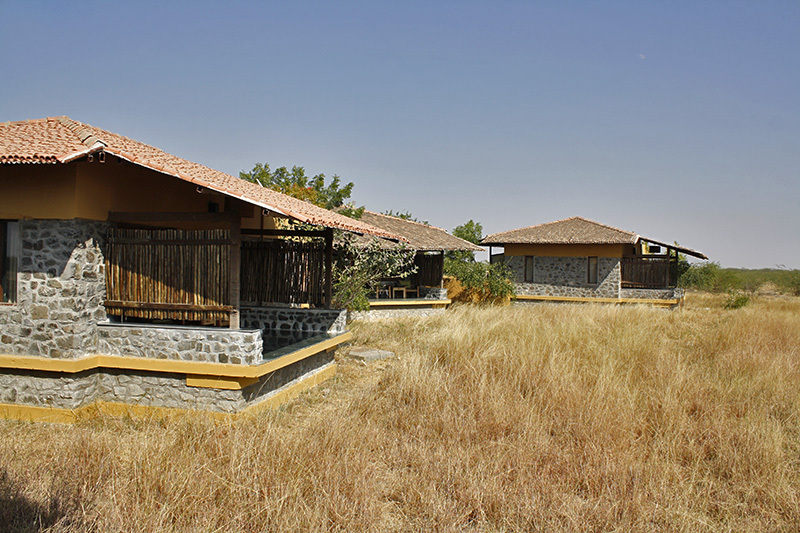 As the name suggests, this is one of the best places to observe herds of Blackbuck either grazing in the golden grasslands or leaping with all fours midair. You can also see the large antelope, Nilgai. Predator mammals like Striped Hyena (Hyaena hyaena), Golden Jackal (Canis aureus), Indian Fox or Bengal fox (Vulpes bengalensis) can be commonly observed, but the Indian wolf (Canis lupus pallipes) is a rare sight. 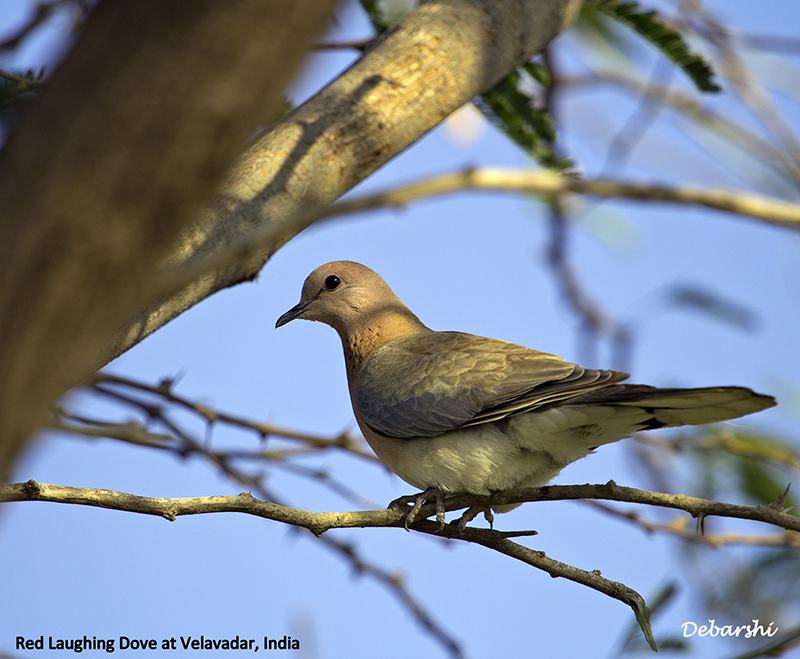 Bird Watchers will be absolutely delighted with more than 200 species apart from endangered bird species like the Lesser Florican or Stolizca’s Bushchat. 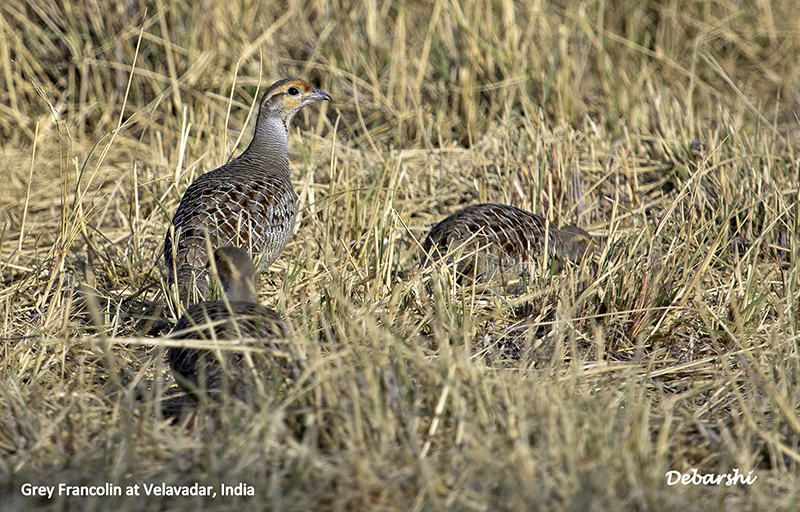 The grasslands have a lot of mammal sightings, while the wetlands are renowned for the water birds. 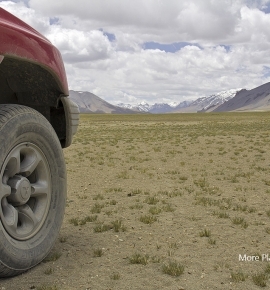 This national park is easily accessible by road, rail or flight. The nearest airports are Ahmedabad about 170 km while the smaller airport in Bhavnagar about 51 km away. Ahmedabad is also well connected by Indian Railways. You can also use the nearest junction – Dhola about 50 km away though not frequented by major trains. In case you are not travelling by a private vehicle, you can also use a number of buses. Velavadar is connected with multiple cities in Gujarat. You can also book tickets online now. There are daily buses between Bhavnagar and Velavadar; leaving Bhavnagar at 2 or 3 pm and returning from Velavadar at 6 or 6:30 am. There are just two places to stay in Velavadar. We stayed here at the really posh and comfortable when visiting Velavadar. 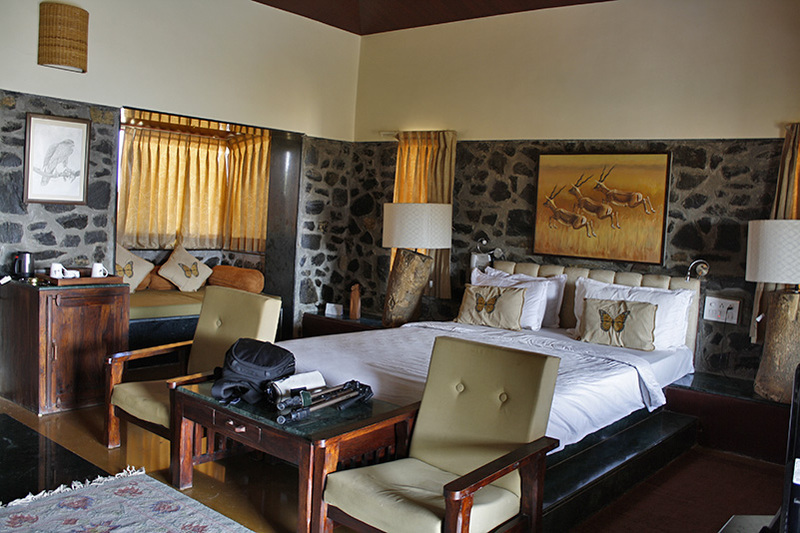 This is an epitome of luxury in the wilderness and has been featured in the Conde Nast Traveller Magazine as well. 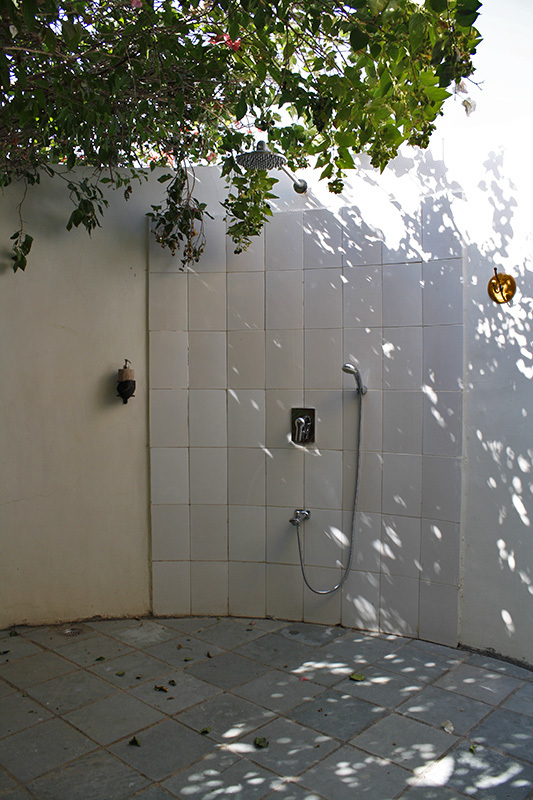 There are 14 air-conditioned cottages with soft beds, bathrooms with outdoor showers and an open rear patio. Nilgais actually came close to observe us when we sat in the patio. The dinner and breakfast buffet is multi cuisine and quite a generous spread while viewing lapwings, shrikes and cisticolas. You will also get great clicks of the starlit night skies. 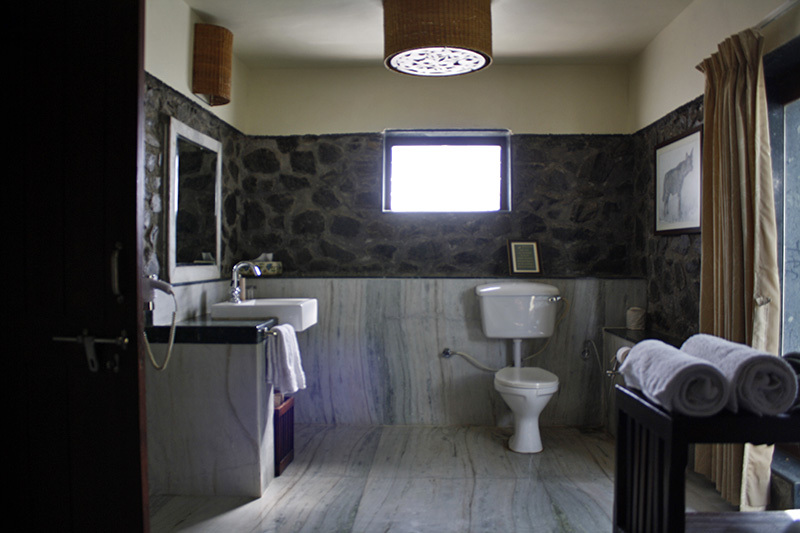 The lodge also arranges for safaris in their jeeps along with an experienced naturalist .For reservations, you can check out in this link. This is a much more economic option and is operated by the Forest Department. 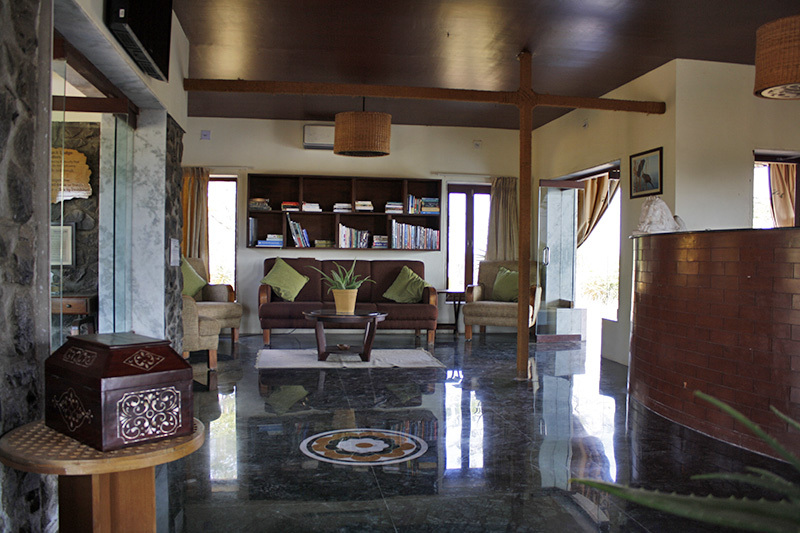 There are 4 rooms (both AC and non AC) and its immense attraction is that it is within the sanctuary. You can book this by making 100% advance payments by Demand Draft to the Forest department – Assistant Forest Conservator, Velavadar, Blackbuck National Park. Tel. : 0278-428644. This is a trend similar to a lot of African countries where you can drive your own vehicle into the park in the outlined mud road. We also observed this in Panna National Park in Madhya Pradesh in India. You can also hire a vehicle (with the in-house naturalist) from the Blackbuck Lodge costing around ₹1800/- to ₹2000/- per safari. Foreign nationals are charged $5 per head for entry. 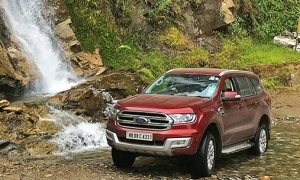 National Park fees cost ₹400 per vehicle (6 heads) and ₹100 for a forest department guide. Camera fees are additional ₹100 per camera. 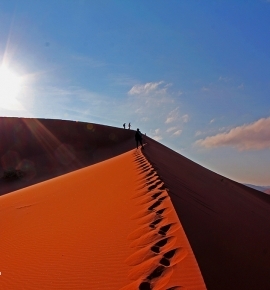 The park allows Safaris in two slots – Sunrise to noon and again 2 pm to 6 pm depending upon the season. Famed only amongst birdwatchers, I would still encourage you to visit this park anytime between December to March. 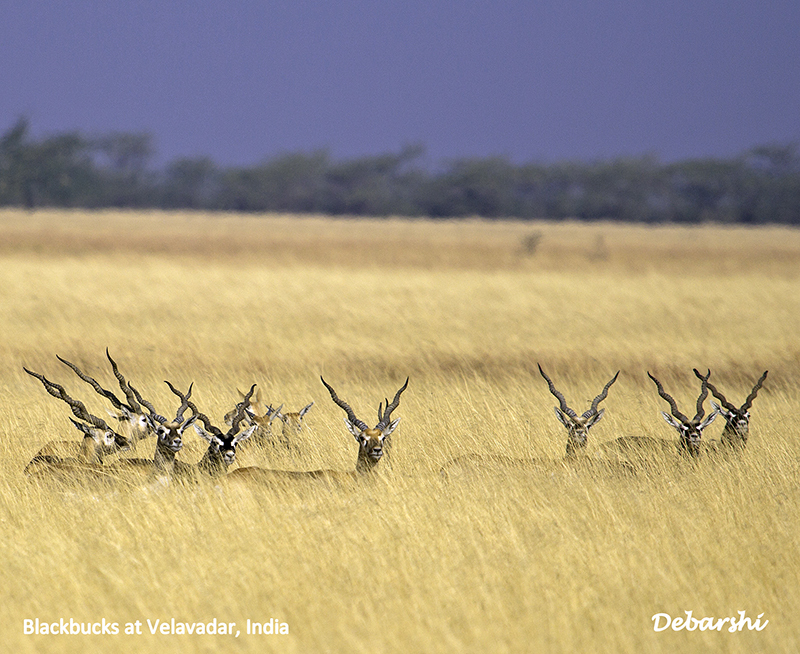 The flat lands and the golden grasses make it one of the best places to observe herds of Blackbuck. Who knows, if you are in luck you may also get to see the critically endangered Lesser Florican! One of my coffee pals recently christened me as a ‘Social Butterfly’ since striking up a conversation occurs to me naturally. Visiting places of yore and gazing at their architecture, imagining how life was then energizes me. Add to that the appeal of staying in picturesque resorts. 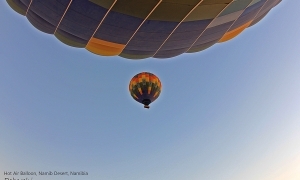 But what makes my heart jump? Well my love for canines is legendary and I pet and feed them where ever I go . This gets extended in my adoration for all animals be it a lion or a bat or a gecko . Nothing exalts me more than waking up really early and ride to the forest with a pair of binoculars.